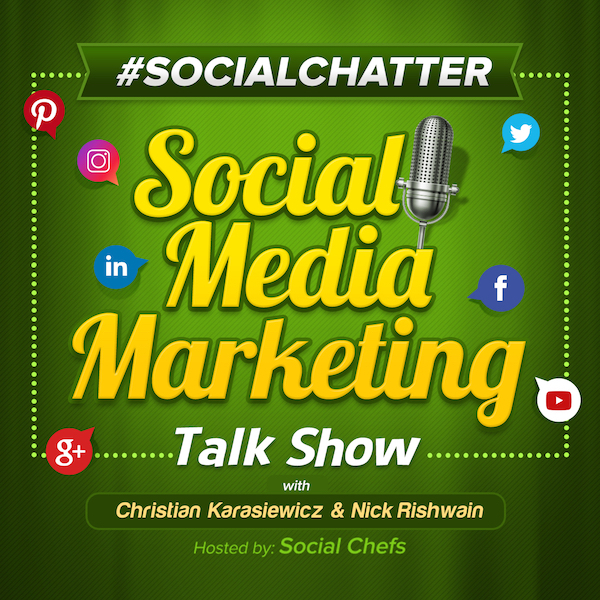 Welcome to this week's episode of Social Chatter, the longest running social media marketing talk show where we cover the latest social media news from this past week, including Snap Maps, Facebook Messenger replies, Twitter labels, Loopback from Rogue Amoeba and more. For those of you who missed last week's episode on Facebook Stories Insights and YouTube copyright matching, with Jessika Phillips, you can watch the replay here. Let's see what's new in social media this week with, Christian Karasiewicz, Troy Sandidge and guest, Gael Gilliland. In Twitter news, they are cutting down on the number of people you can follow per day from 1,000 to 400. Follow, unfollow, follow, unfollow. Who does that? Spammers. So we're changing the number of accounts you can follow each day from 1,000 to 400. Don't worry, you'll be just fine. Twitter his trying to clean-up their platform. One way they are doing this is by limiting the number of people you can follow per day. There are third-party tools that made it easy to quickly follow and then unfollow someone, thus boosting your Twitter followers. This wasn't an approved technique, and so Twitter started suspending apps that violated this rule. As a business, while this seems like it will make it more difficult to build your following, it should help to improve the people you get to follow you. Overall, it should also improve the quality of users on Twitter - all wins for you was a business owner. We're glad to see Twitter focusing on removing spam accounts and inauthentic users from their platform. You can read more about Twitter cutting down on the number of people you can follow here. Twitter is testing Twitter labels on replies. When you're looking at a Twitter thread, you should see three new labels, "author", "following" and "mentioned." The "author" Twitter label will be applied to the person who wrote the original tweet. The "Mentioned" label will be for replies to a suer in the thread's original tweet. The "following" label will be for Twitter users who follow the author of the tweet. Here's a look at Twitter labels in a tweet. Twitter labels can make it easier for your business to follow tweets. You can also identify people you may want to connect with via a Twitter thread. You can read more about Twitter labels here. In Twitter news, they are launching a way to appeal Twitter suspensions faster via their mobile app. For those of you who need to appear a Twitter suspension, you can file an appeal via the Twitter mobile app, if you believe your account was wrongfully suspended. Here's a look at how the process works. We move quickly to enforce our rules, but sometimes we don't have the full context and can make mistakes. Previously, if you needed to appeal a Twitter suspension, it would take a lot of waiting. Twitter hopes to cut down on response times by 60 percent. If Twitter decides that you've broken their rules and they suspend your account, they will send you a notification with the tweet in question (along with the rule you violated). You can then appeal the process right from the Twitter mobile app. You'll just need to supply information on why your account shouldn't have been suspended. As a business, it can be frustrating to have to wait for Twitter to get back to you. This new way should bring the times down to a few hours in most cases. This will save you time. You'll also be able to know which rules you broke so you can make your claim to Twitter. This is a good move by Twitter, as it demonstrates their desire to be more transparent. It also helps clean-up the platform. You can read more about appealing a Twitter suspension here. In Facebook news, Facebook Pages can now crosspost videos to multiple Pages. This feature is similar to being able to crosspost Facebook Live video except it's for uploading videos directly to Pages. Do you manage multiple Facebook Pages? If so, you can take advantage of a new feature. When you go to upload a video to a Facebook Page, you can now choose to crosspost that video to other Pages. This will not only save you time, but it can help repurpose relevant content from one Facebook Page to another. To use the Facebook Page video crossposting feature, simply upload a video to your Page. You should now see an option to "post video across Pages." Follow the steps and you'll now be able to quickly crosspost videos to other Pages. Note: This is from desktop. Mobile doesn't yet seem to have this option. Previously, if you wanted to reply to something in Messenger, you had to just reply and hope the other person looked back through the conversation. Now within Messenger from the mobile app, you can swipe right on a thread to reply to it. When you reply to an individual Messenger thread, it will show the part of the message you are replying to, as well as your comment. Here's a video showing you how to use Facebook Messenger replies from mobile. If you're on desktop, you can click on the … option and choose "reply" to get Facebook Messenger replies from desktop. Facebook Messenger replies make it much easier for you to reply to a customer via Messenger - in the right order. This way your message comes across to them to show exactly what you were replying to - so there's no confusion. To get Facebook Messenger replies, be sure you update your Messenger app from your devices app store. In Snapchat news, they are testing Snap Maps and Snapchat Mention Stickers. Here's a look at Snap Maps, which will make it easy for you to check-in to a location using a Bitmoji. People will be able to see what you're up to (for up to four hours). Your character will also show what you're doing, such as working, gaming, eating and more. The other feature Snapchat is working on is Snapchat Mention Stickers. If you're interested in growing your connections, you need to broaden the people you're connected to. With Snap Maps, you can quickly find others that are nearby to connect with. In addition, Snap Maps can help you see what others in your area are interested in. This way you can take a look at the products and services that you offer and consider expanding or adjusting them. For those of you using Snap Stories, by adding Snapchat mention stickers, you can collaborate with others on Snapchat and mention them. This way it helps to ensure that they see them. It also helps to build connections. People who you're connected to, might meet someone new (thanks to you mentioning someone in a mention sticker). Both of these features are in testing. Hopefully they will launch soon. In the meantime, you can learn more about Snap Maps and Snapchat mention stickers here. The first tool that we have discovered this week is Figma. Figma is a browser-based design, prototyping and collaborative tool. Figma makes it easy for you to collaborate on designs, prototypes and more from your web browser. You may need to work together with your web designer to build a new website. If you create and design your own apps, Figma would be useful when working on a prototype for your design. This way you can collaborate in real-time, as opposed to having designs created and sent. Overall, it helps to strengthen your bond with your team. It also saves you time and can help cutdown on wasted time emailing back and forth. You can try Figma for free from the link below. Prices then start at $12 per editor per month. The second tool that we have for you this week is Loopback from Rogue Amoeba. Loopback is a Mac application that you can use to quickly route the audio between applications and audio devices to your audio processing software. For example, you can quickly combine audio from multiple sources, such as Skype, FaceTime, Logic Pro and your USB microphone, into one virtual device. Some ways you can use Loopback are to play music on your Podcast, for screencasts, live video and more. Loopback is a freemium tool. You can try it out. If you want to upgrade, it runs $99.